Jim Leyland won’t change his underwear! The Detroit Tigers are on their longest winning streak in 77-years… and manager Jim Leyland is on a dirty underwear streak since he is wearing the same pair since his Tigers lost their last game on September 1. Along with his underwear, Leyland has worn the same pair of socks since that streak began, which now has holes in them. “I told (Jim) Schmakel [Tigers clubhouse manager] if somebody threw them out, that would be the end,” Leyland said. Leyland has good reason to be cautious, the Tigers have blown notorious leads in September during the last month of the MLB season… but now its only the competition smelling fear. The Tigers have a 14 game lead in the AL Central division. Matt Garza throws a no-hitter; Jim Leyland no-spitter? On Monday night, Tampa Bay Ray Matt Garza pitched a no-hitter in the Ray’s 5-0 win over the Detroit Tigers. Garza’s no-hitter is the first one in franchise history, but not the first no-hitter this season. The year of the pitcher, Garza becomes the fifth player to pitch a no-hitter in 2010, well on track to beating the record of seven no-hitters in season back in 1990 and 1991. While baseball fans have seen plenty of no-hitters and one kinda perfect game, Tigers manager Jim Leyland also gave fans a no-spitter. Leyland is in the midst of a spitting controversy. 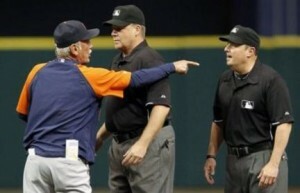 Umpire Marty Foster is claiming Leyland spit on him during an altercation in the third inning of Garza’s no-hitter. Leyland was tossed from the game after arguing with Foster over Ray’s B.J Upton’s stolen base. The MLB is investigating the incident and will decide if further disciplinary action will be taken.